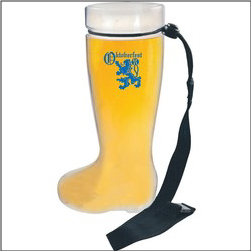 Order custom Imprinted German Beer Boots for your next beer festival event or brewery celebration. These mug steins are perfect for Oktoberfest events, brewery events, festivals, and are great because they are made of heavy blow-molded pvc plastic (for safety). Recyclable and BPA Free. Each mug comes with lanyard. Call today to order your event items!